We’d love your help. Let us know what’s wrong with this preview of 97 Things Every Programmer Should Know by Kevlin Henney. With contributions from some of the most ex Tap into the wisdom of experts to learn what every programmer should know, no matter what language you use. With the 97 short and extremely useful tips for programmers in this book, you'll expand your skills by adopting new approaches to old problems, learning appropriate best practices, and honing your craft through sound advice. To ask other readers questions about 97 Things Every Programmer Should Know, please sign up. 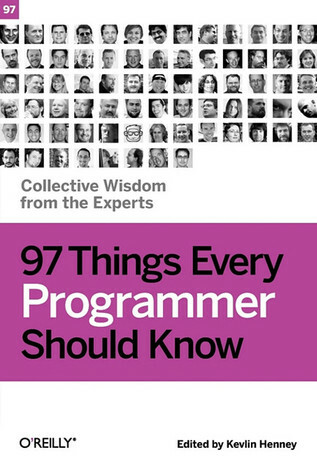 "97 Livejournal Posts: Collective Suggestions from 20 Experts You've Heard Of And 77 Random People"
This is a book with 97 tips for programmers, each tip takes up two pages or less, written by different programmers (a few get more than one entry). Here's the problem: 2 pages isn't enough to say anything useful about anything. And taking 97 useless writings and concatenating them together doesn't create a useful one - the size limit of each entry prevents anything from being particularly valuable. "97 Livejournal Posts: Collective Suggestions from 20 Experts You've Heard Of And 77 Random People"
This is a book with 97 tips for programmers, each tip takes up two pages or less, written by different programmers (a few get more than one entry). Here's the problem: 2 pages isn't enough to say anything useful about anything. And taking 97 useless writings and concatenating them together doesn't create a useful one - the size limit of each entry prevents anything from being particularly valuable. Sure, there are some gems occasionally, but it's mostly the same old stuff everyone knows (write unit tests, learn commandline tools, write good comments, write no comments, refactor, DRY, SRP, etc) and a handful of random crap (learn a foreign language). Hilariously, there are occasional serious computer scientists thrown into the mix - one post goes into a lot of detail about how floating point rounding errors happen, including formulas and mathematics, and his tip is sandwiched between a tip on encapsulating behavior with state and one on contributing to open source (as a side note, I am getting kind of tired of the attitude that open source projects are a great dumping ground for practicing your programming skills, rather than real projects worthy of the same kind of care and consideration as your day job). "Install Me" wins the award for being the whiniest, most annoying post in the entire pack, it should be mentioned specifically. In any case, most of these posts are a lot of "trust me" or "based on my experience" - no claims have any real evidence, and no tutorials or suggestions contain useful examples - how could they, with only two pages to work with? Every one of these suggestions should be the central thesis of its own book that goes into greater depth, and collecting 97 book descriptions together does not make a new book. Here's a good rule of thumb: if you are a writer contributing to a book, and someone asked you to do a 90-minute presentation on your material, could you do it? How about a 60 minute presentation? 30? A 5-minute lightning talk, at least? If your entire contribution can be covered in an elevator ride, it's not worthy of a book. Про 10 заповедей вы наверное слыхали?! Вроде все логично, вроде все правильно. Но только в теории. В книжках. а вот на практике, в жизни все почему-то не так. Вроде и родителей любим, и врать не хотим, и до чужих жен дела нам нет. Ан нет, на деле все не так гладко, чтобы не сказать грустно (но это не про нас, правда?). Так вот "97 Things Every Programmer Should Know" это те самые заповеди, только для программера. Прочитать их стоит, к тому же ребята пишут легко и просто. Заповеди коротенькие, одна-две странички. Все по делу, все правильно. А в жизни? Ну, вы свои супер проекты сами знаете. И их состояние (проектов, кода, тестов, документации и т.д.) тоже (а вот это уже про нас). В книге два оглавления, по нумерации страниц и по темам. Так вот оглавление по темам мне очень понравилось. Системный подход! Состав со-авторов мне показался слабоватым. Только два корифея индустрии. Среди со-авторов подозрительно много норвежцев. Я не знаю с чем это связано. И ещё одно замечание: в списке со-авторов плохо (практически никак) представлено сообщество Open Source. В нескольких местах откровенно неправильно трактуется GPL лицензирование и т.д. Impulse buy on my Kindle. I stopped reading about half way through because I was hoping to get more specific advice. Most of it was sort of "floss between meals" advice that I already know (and ignore). I'd recommend Pragmatic Programmer or Code Complete 2 instead of this book. This is a provocative title! What practitioner in any field could see a title like "X Things Every Y Should Know" and not wonder, "Do I know all of these X things? I should know them all, as I am, indeed, a Y!" Really far more than just "Things", this is a collection of good advice. Interestingly, it's good even when (perhaps especially when) it is contradictory. I believe it is wise to pay attention to good advice. I believe it is even wiser to be able to choose the right advice to follow at the This is a provocative title! What practitioner in any field could see a title like "X Things Every Y Should Know" and not wonder, "Do I know all of these X things? I should know them all, as I am, indeed, a Y!" I believe it is wise to pay attention to good advice. I believe it is even wiser to be able to choose the right advice to follow at the right time. This is the sort of book I think every programmer should read on a monthly basis. It doesn't have to be a book, of course. It can also be articles like Joel Spolsky's 12 Steps to Better Code or Dave Thomas' Code Kata. If you've been a programmer for a while, the vast majority of the advice in this book should merely reinforce that what you're already doing is correct. If not, you'd be well-advised to take it seriously. A certain percentage of the tips here are not going to apply to your specific situation. If you're not working on a project with a traditional "build" you can ignore advice relating to automating the build and refactoring the build. If you are a solo developer, you can ignore the advice about pair programming. While you can ignore it, I recommend reading the advice anyway. It only takes a few minutes and you may learn something interesting. Who knows, you may wake up tomorrow and somehow find yourself in a team working on an application with a nightly build! You'll be all set. One of the most interesting (to me) subjects that cropped up several times in the course of the book is the idea that you can take good ideas in other languages and implement them in the one you're using. For example, functional programming is all the rage right now, and for good reason. Functional programming creates predictable "no side-effects" code which is especially useful in programs with asynchronous, concurrent, or parallel execution. But you don't have to use a functional language like Erlang or Scheme to pull of functional programming techniques. Code without global variables and functions with predictable return values can be written in practically any language. Of course, to capitalize on this idea, just reading about it will get you nowhere. That's why we have the advice to learn a new programming language often! Much advice concerns creating beautiful, simple, elegant code with function and variable names that clearly describe their purpose. Also, how to use comments effectively (say something the code cannot say). I completely agree with these points. For more on this subject, I can think of no better book than Code Complete, Second Edition. It deserves a re-read every other year or so. A lot of the authors stress variations of "keep quality high." It's easy to let things slip at various points in the development process, especially under tight deadlines. Robert C. Martin perhaps best sums it all up in "The Professional Programmer" in which he describes a doctor performing a hypothetical open-heart surgery. Do you want him "...rushing and making a mess? Do you want him to say, 'I'll go back and fix this later'?" I'm also reminded of Don’t Live with Broken Windows from the book The Pragmatic Programmer: From Journeyman to Master. Some advice is extremely general. I like "Do Lots of Deliberate Practice" by Jon Jagger. The idea is that if you perform about 10,000 hours of deliberately practicing to improve your ability to do something (like programming), you will master it. Deliberate practice is not just doing something to get it done, but attempting to do it better than before. Mastery is not easy, but it doesn't take any particular innate talent and it is certainly worth the attempt. Jagger has another excellent article "Make the Invisible More Visible." It's the idea that without visible progress in a project, perhaps there has been no progress at all. It sounds very Zen, but he has some sound reasons for this philosophy and ways to make progress visible! Several authors advocate reading other people's source. This is good for learning not only what to do, but also what to avoid. If someone else's source is hard to read, why is it hard to read? Try to avoid doing that in your own code. Speaking of reading other people's source, "Fulfill Your Abmitions with Open Source" by Richard Monson-Haefel not only explains why you should join an open-source project, but also has some great specific ideas how to join. General advice I agree with wholeheartedly and are already part of my development philosophy: "Hard Work Does Not Pay Off" by Olve Maudal and "Reinvent the Wheel Often" by Jason P. Sage (sage advice indeed, ha ha). Sometimes it's just nice to hear someone who agrees with you. To be perfectly honest, I'd heard all of this advice before. So why do I think it was so valuable to read it again? Because if I'm equally honest, I haven't heeded all of it as well as I might. It has shown me where I have room for improvement. Like my embarrassing lack of automated testing/unit testing! I'm taking all of the ideas from "Take Advantage of Code Analysis Tools" by Sarah Mount to heart. "Before You Refactor" by Rajith Attapattu probably contained the stuff I least wanted to hear, but needed to. It's a list of reasons not to refactor or restructure and rewrite code. I'm not sure any programmer wants to hear this. But the reality of the matter is that Rajith is right - existing code is often tested, working code. It may be ugly, but it's valuable. I think Joel Spolsky has one of the best articles about this, Things You Should Never Do, Part I.
I'm also guilty of writing features because they're fun or I might need them later on. "Improve Code by Removing It" by Pete Goodliffe explains the YAGNI principal ("You ain't gonna need it"). Two authors also stressed the value of using domain-specific types (most often taking the form of custom classes) in place of system types to eliminate whole rafts of data validation pitfalls. This is an idea I probably haven't applied enough (I make domain-specific types all the time, but I rarely create them for data validation alone). Some of the articles don't work well, and I think it's most often those with poor examples or no examples at all. Sam Saariste's "Resist the Temptation of the Singleton Pattern" suffers from this. His points about the dangers of using singletons (guaranteed single instances of an object) are well taken. Essentially, they're gussied up global variables. But without a single example showing an instance in which a singleton could have been replaced with another construct, it's kind of like saying "don't write bad code." A few of the articles were so specific that they failed to be generally useful. Chuck Allison's "Floating-Point Numbers Aren't Real" makes a good point about the accuracy of floating-point numbers when approaching the limits of their capacity. But it seems to me that this could be supplanted with more general advice about the foolishness of getting that close to the limits of your data type for the sake of efficiency in the first place. Short, easy to read and available for free. But maybe too obvious. Probably for younger me or the industry improved a lot since the book was written. Encapsulate Behavior, not Just Short, easy to read and available for free. But maybe too obvious. Probably for younger me or the industry improved a lot since the book was written. If nothing else, it's an aptly named book. It does indeed contain 97 things every programmer should know. Sadly for me, I knew pretty much all of them. I still managed to find some interesting ideas or some very nice formulations. I tried to imagine how this book will appear to a novice programmer and I think it might be useful. I certainly wish that the novice programers I've worked with knew that stuff. - Write Tests for People If nothing else, it's an aptly named book. This is great, because it makes the book very easy to drop at any point and pick up again later. Unfortunately, there are two downsides – two pages are not enough to go into sufficient detail on most subjects and the random switching of subjects makes it hard to remember most of the book after reading it. for beginners maybe. but i did not learn anything from it. some chapters are about the same thing with different title. basically if you are in dev for more than 5 years - don't wast your time on it. Not all essays will apply to you (I didn't need to be convinced of the benefits of code reviewing), but there's something here for every programmer. None of us are perfect; we could all stand to learn something new or improve on something. This book is like a thoughtful performance evaluation that inspires you to step up your game. And write more tests, dammit. I'd recommend this for all programmers, especially those who don't think they need to read this. 97 tips from experienced professionals (two pages each) about the software development process in general. It's not very detailed, best suitable for intermediate programmers. Some of the topics (like version control, commit history, comments, testing, agile, etc.,) may act as a quick refresher for advanced programmer 97 tips from experienced professionals (two pages each) about the software development process in general. The "Beware the Share" chapter by Udi Dahan resonated with me. I also now buy into version control. "It was my first project at the company. I'd just finished my degree and was anxious to prove myself, staying late every day going through the existing code. As I worked through my first feature, I took extra care to put in place everything I had learned - commenting, logging, pulling out shared code into libraries where possible, the works. The code review that I had felt so ready for came as The "Beware the Share" chapter by Udi Dahan resonated with me. I also now buy into version control. "It was my first project at the company. I'd just finished my degree and was anxious to prove myself, staying late every day going through the existing code. As I worked through my first feature, I took extra care to put in place everything I had learned - commenting, logging, pulling out shared code into libraries where possible, the works. The code review that I had felt so ready for came as a rude awakening - reuse was frowned upon!" "How could this be? Throughout college, reuse was held up as the epitome of quality software engineering. All the articles I had read, the textbooks, the seasoned software professionals who had taught me - was it all wrong? "It turns out that I was missing something critical. "The fact that two wildly different parts of the system performed some logic in the same way meant less than I thought. Up until I had pulled out those libraries of shared code, these parts were not dependent on each other. Each could evolve independently. Each could change its logic to suit the needs of the system's changing business environment. Those four lines of similar code were accidental - a temporal anomaly, a coincidence. That is, until I came along. "The libraries of shared code I created tied the shoelaces of each foot to the other. Steps by one business domain could not be made without first synchronizing with the other. Maintenance costs in those independent functions used to be negligible, but the common library required an order of magnitude more testing. 97 very short pieces all containing little insights into what makes one a better programmer, written by a field of experienced programmers - mostly white dudes. It's a short read, and definitely worth going through. There is a lot of good insight. I would say 60% of the pieces contain a valuable message - do testing. be careful of this usual pattern in testing because here's an anecdote where it failed. don't use this pattern. The other 40% I would say suffer from programmer's arrogance a bit too 97 very short pieces all containing little insights into what makes one a better programmer, written by a field of experienced programmers - mostly white dudes. It's a short read, and definitely worth going through. There is a lot of good insight. I would say 60% of the pieces contain a valuable message - do testing. be careful of this usual pattern in testing because here's an anecdote where it failed. don't use this pattern. The other 40% I would say suffer from programmer's arrogance a bit too much and are very debatable. About 5-10 pieces actually are great and make sifting through this book worth it. But again, too many white male voices. I'm certain that diverse voices define a broader insight. Especially since pieces approaching programming as a people problem from a bird's eye view are rare in this book, I'm sure that replacing these 40% debatable pieces with more the voices of women, people of color or women of color would make this a 5 star book. After having first read 97 Things Every Software Architect Should Know, I at least found this one more interesting. As could be expected, the Every [...] Should Know part of the title is quite a stretch, but there's some good advice here and there. I would have expected more stuff like Understand the difference between a decimal and a floating point number, or Beware of invisible unicode points, such as byte-order marks (cost me half a day, once), but most of the articles were focused on the (inte After having first read 97 Things Every Software Architect Should Know, I at least found this one more interesting. I would have expected more stuff like Understand the difference between a decimal and a floating point number, or Beware of invisible unicode points, such as byte-order marks (cost me half a day, once), but most of the articles were focused on the (inter)personal aspects of software development, more than actual programming. In all, I think I counted three or four articles that contained any code at all. If you bought this, then you've wasted money, regardless of your level of expertise. If you're a novice who's just starting out or a developer who wants to find out more about best practices, find books that target the areas you're looking to improve on; they will be way more useful by providing concrete and specific examples. If you're an expert looking for a refresher, just about any software development blogs, sites, or forums that you've been following (you are doing this, right?) will give yo If you bought this, then you've wasted money, regardless of your level of expertise. If you're an expert looking for a refresher, just about any software development blogs, sites, or forums that you've been following (you are doing this, right?) will give you better value. The 97 things are each told in a max of 2 pages - very little room for anything more than a generic discussion. They range from common sense and popular practices to technical challenges and domain expertise. I doubt any professional developer would find even half of these immediately relevant and applicable to their current work/role. They just cover too many areas in too few details. If you're a programmer, you should definitely read this book through at least once. I'd say about 25% of the book was not directly relevant to me, 50% was something I was already quite familiar with, but that remaining 25% was excellent material that made me think in new ways. Each essay is only 2 pages, so you won't go in-depth on any topic, but it will hopefully spark your desire to learn more. One critique of the book is how it's organized. It appears that the 97 items are simply listed alphab If you're a programmer, you should definitely read this book through at least once. I'd say about 25% of the book was not directly relevant to me, 50% was something I was already quite familiar with, but that remaining 25% was excellent material that made me think in new ways. Each essay is only 2 pages, so you won't go in-depth on any topic, but it will hopefully spark your desire to learn more. The book lacks something which would glue those 97 pieces together. It isn't well-structured and some things are already outdated. 97 Things might be good for a beginning programmer to show him what he already knows and what issues should he read about. All information are very brief and to get a good grip on the selected topic you must search for some other books. If you are an experienced programmer already, the lessons in this book might be known to you already but it never hurts to know these ideas even if it simply validates what you already believe in. If you already know all these, then you might probably be leading rookie programmers, so save yourself time and tell them to read this book before their rookie mistakes become your responsibility. Sure this book is not be-all and end-all of programming but it does give you the foundations on what to lo If you are an experienced programmer already, the lessons in this book might be known to you already but it never hurts to know these ideas even if it simply validates what you already believe in. If you already know all these, then you might probably be leading rookie programmers, so save yourself time and tell them to read this book before their rookie mistakes become your responsibility. Sure this book is not be-all and end-all of programming but it does give you the foundations on what to look out for. Knowing other programmers problems that you have not seen before would make you think of possible solutions that they offer or perhaps it can be a catalyst for you to device your own solution. I wished I've read this book during my early days of programming. It is full of nuggets of wisdom from these accomplished people that I only later knew by falling into these traps and having experience give me the hard lessons. Reading them now makes me think -- "Now you tell me!". Many of the lessons here are not new to an experienced programmer but you don't have to wait to experience it yourself because that could be expensive and career limiting. This book contains 97 tips from experienced professionals about the software development process in general, each one succintly described in less than two pages. The advices cover a large variety of topics: programming (pay attention to the warnings also, learn the tricks and shortcuts in your IDE, design a readable API for your methods, have separate exception handling for framework and bussiness logic exceptions, write only usefull comments), deployment (deploy the solution early and often, av This book contains 97 tips from experienced professionals about the software development process in general, each one succintly described in less than two pages. The advices cover a large variety of topics: programming (pay attention to the warnings also, learn the tricks and shortcuts in your IDE, design a readable API for your methods, have separate exception handling for framework and bussiness logic exceptions, write only usefull comments), deployment (deploy the solution early and often, avoid different versions for different environments), testing (automate your tests, make scripts to run tests after hours), continuous improvement (listen to technical podcasts on your commute, learn a programming language every year), design patterns and SOLID principles, general advice about communication inside a software development team and even some tales about the history of software engineering. Since these are just general advice, the authors ca not go into much depth explaining the topics and the continuous change of the context and lack of a central idea are making this a bit harder to read. However, if you feel you resonate with some authors, you can search for some other work of theirs later on. well, this book consists of 97 two-page tip and experiences about software development. some are about habits, some are about best practices, some are about the way you should look at things, etc. it was of course worth reading. somehow i can say it is essential to every programmer. but of course there's a best-time-to-read-this-book. I think coders with less than 1 year have some more important stuff to do: work. the things mentioned in this book will have their best effect, when the reader has well, this book consists of 97 two-page tip and experiences about software development. some are about habits, some are about best practices, some are about the way you should look at things, etc. it was of course worth reading. somehow i can say it is essential to every programmer. but of course there's a best-time-to-read-this-book. I think coders with less than 1 year have some more important stuff to do: work. the things mentioned in this book will have their best effect, when the reader has been out there working for a while, to me: at least six month-full time. before that, although some of the tips still can be useful, but you will miss many aspects of them, just because you are reading the solution about a problem that you haven't met yet. to sum up: this is a really useful book, written as simple as possible (not like those convoluted books that make you struggle understanding every sentence.) and it sure has gather some great wisdom together, about all aspects of software development. suggestion: considering what I wrote above, this book will make a great gift to your friend/colleague in their one-year-anniversary as a developer/programmer. A significant amount of the advice within is stuff that is drilled into computer science undergrads in one way or another. Perhaps the articles were a lot more groundbreaking back when this book was released, and haven’t retained their edge due to the fast pace of the field. I’d be interested in seeing a refreshed version of this book which collects more recent articles that might introduce some more up to date thinking. Great book. I really enjoy the stories that go along with the bit of wisdom mentioned. Although I agree that all programmers should know these things, no one environment can fit into the mold that would allow for all scenarios in this book to work out positively. I work for a small enough team that we don't have a QA department, for instance. Still, the book is a fun read and has some good tidbits to remember. An interesting collection of things various programmers think would make your life better. Some are things I knew (version control); some I didn't, many seemed not fully described in the space available. I think the idea is that you pick this up, read one entry, and think about its lesson; but the entries should be a little more complete in general. A quick read with very high-level advice for novice programmers from experts. Most of what's written here could be summed up with, "Code more, write tests, and learn from your mistakes." While the book wasn't boring, it definitely lacks much depth for anyone with a fundamental understanding of programming. Still, it was great for reflecting on the concepts behind crafting code. You will need to apply your judgement while reading about how, where and when to use these pieces of wisdom by some really great developers. It won't necessarily make you the best programmer out there, but it definitely would give you some direction in places where any beginner developer feels at a loss. The book brings nice advices, specially if you are a beginner programmer. If you have some experience, maybe you will know couple things already, but those don't diminish the book's value. It's still a good collection of advices that every programmer should know. Recommended reading in this case. Out dated and a little abstract at times. Every newbie to development should read this and seasoned professionals should read it on occasion as a refresher. This book is really an easily digestible package.